HCM City (VNA) – Vietnamese importers and exporters should stay alert and take a proactive approach to risks posed by the unpredictable development of the US-China trade tension, experts said at a workshop in Ho Chi Minh City on March 22. Deputy head of the Trade Remedies Authority of Vietnam Chu Thang Trung said that the trade war between the two largest economies of the world has been affecting the goods trading flow, and increasing the US’s trade defence investigations against its big importers. It has also forced the two countries’ enterprises to seek ways to intensify exports to third countries, putting import pressure on other markets, including Vietnam, Trung stated. According to him, if the trade war is not solved early, there is a great risk for Vietnamese exporters to be subject to trade defence investigation and measures of the US. He cited as examples several cases in the past, when the US’s investigation and trade defence tax targeting Chinese products were usually followed by measures against the same kinds of Vietnamese product 3-4 years later. 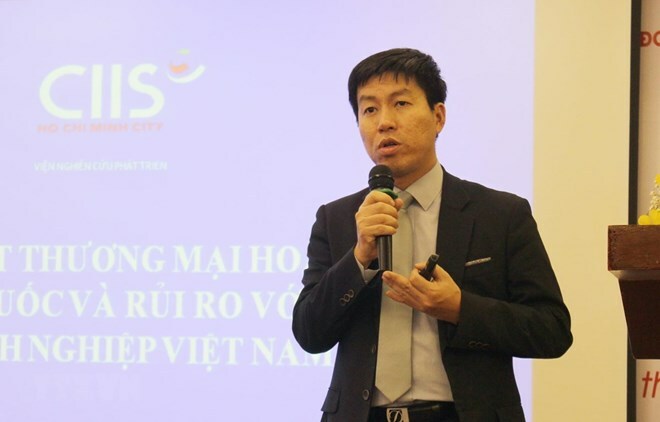 Lawyer Nguyen Thi Phuong Thao from IDVN Lawyers Firm said that the biggest risk of the trade tension for Vietnamese enterprises is the transfer of commodities from China to Vietnam. She said Chinese goods will enter Vietnam in the form of temporary import for re-export or for simple processing in order to gain Vietnamese origin, and then be exported to the US. This move will help Chinese goods avoid high taxes, but it will be a good reason for the US to conduct an investigation and apply trade defence against Vietnamese products. Therefore, she advised Vietnamese businesses to keep themselves up to date regarding trade defence measures imposed on products of China and other competitors. They should also think twice before using materials originated from China and other countries which are subject to US trade defence measures.